Daikoku charged with his staff aiming straight for Mikagami, who blocked it with Ensui prefectly. Daikoku was shocked while the audience was awed. 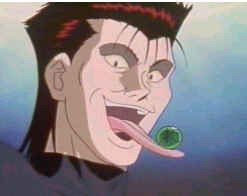 Recca understood what did Mikagami meant about the spinning fan. He explained, “If you put your finger into the spinning blades of a normal, you’ll get hurt. But if you put your finger at the middle of the fan, it will slow down and eventually will stop.” In contrast with the fight, Mikagami had used the tip of Ensui onto the middle of the staff’s end. (Since the position that Daikoku held it was in a poking position) Saicho was amazed by the technique. Kukai had doubts about Daikoku’s chances of winning after seeing that Mikagami had Ensui. If Mikagami’s teacher was whom he was thinking of, then Daikoku would definitely lose. Daikoku continued, this time, with a 10000-attack technique, but Mikagami once again blocked it without breaking a sweat. He ended the fight by destroying the staff as well slashing Daikoku. Daikoku collapsed with heavy bleeding. The referee announced the winner - the Hokage. Extremely delighted with their first victory, the Hokages instantly congratulated Mikagami by hugging and crowding all over him even though Mikagami cautioned them not to be so happy since this was just the first round. He felt that they were simply embarrassing themselves in front of the audience. Kagero commented if all of them fight normally, Mikagami would be definitely the strongest. Thankfully, he was on their side. The referee announced for the 2nd round, Minamino from team Ku VS Domon from team Hokage. But where was Domon? He appeared, carrying a radio, which was playing his entrance music. Obviously, he was thinking that he was a star or something after he did some ridiculous poses. The Hokage felt the Domon was disgracing them with his act. The fighters then stepped up to the arena and the fight begin. Domon punched Minamino in the stomach, who didn’t feel a thing at all. Domon then punched repeatedly, wondering what kind of body did Minamino has? Minamino said that his body was made up of rubber, baffling Domon. He then extended his arm and punched Domon in the face before he proceed on a beating. Domon fell to the ground, covered with bruises. Kukai explained that Minamino was able to extend his body in various ways and methods and there was no defence method known against it. The audience urged Minamino to kill Domon. In response, Fuko yelled at them to shut up. She yelled at Domon to use his secret weapon. Domon replied as he gets up, that he would use the secret weapon for the best part like those super heroes do. Minamino hit him on the neck. He fell unconscious. The referee was about to end the match when Domon stopped her. Minamino gave him another beating. The Hokages felt that they should end the match before Domon end up dead but Fuko object. This match meanst a lot to Domon who had always been known for his demon strength. But after meeting Kurei, he had lost his confidence and self-esteem. This match would gain back the confidence and self- esteem that Domon had lost. Domon was beaten up again and was kicked out of the arena by Minamino. Kagero wondered how was Minamino able to make his body as elastic as rubber. Then, she realized that he had a Hokage maudough with him. Fuko could not believe it since he was not carrying it anywhere on his body. Minamino smiled and stuck out his tongue. The Hokage maudough, Nan – was in his mouth, which enabled to him to move like elastic rubber. Domon got up, happy to know the reason for his soft body. He didn’t want to use his maudoughs because he felt that it would be unfair fight. But now, it’s a different story. Domon released his secret weapon, Kuchibashi oh (Beak King) and used it on Minamino. Minamino gets caught within its grasp, unable to free himself. Domon punched him hard with the help of Saturn’s Ring. Minamino fell to the ground, helpless. Recca and Yanagi waved their hands in victory. But Domon fell unconscious as well. The referee then announced that this fight was a draw. (Sweat drops for everybody) Mikagami commented that if only Domon had used his brains in deciding to use Kuchibashi oh earlier on. Fuko sighed. Back to a room, where Kurei and Raiha were watching the Hokages. Raiha felt that they had done pretty well so far – a win and a draw. Kurei wondered if they win the Ku with their present effort. While waiting for the 3rd round to begin, Recca encouraged everybody to keep up the good work. Mikagami told Recca that he should not be so naïve – Although Fuko would win the next fight, Recca's opponent, Saicho may look frail but Mikagami sensed great energy in him. In addition, the Ku leader, Kukai seemed to be a gentle monk but looks are deceiving. Recca hoped to fight with Kukai, with a wicked wish of Fuko losing the next round. The angered Fuko beat him up for mentioning it. Kagero observed that Fuko had indeed a lot stronger than she was before. The next fighter from team Ku, Fujimaru, stepped up, promising to win the next round to make up for the disgrace that his team mates had made. The referee gave the signal for the third round to start, both fighters run. Recca sees that speed was the main factor in this match. During the fight, Fujimaru asked Fuko how big her chest was. Fuko called him a pervert but told him her measurements, while throwing darts at him. Fujimaru sliced them with his sickles, lustfully saying that he desire to see her chest (so did the audience). He then throew his sickles at her, causing her long sleeves to be torn. Fujimaru laughed in feverish lust.